An ideal organic meat selection box offering delicious cuts of grass fed meat at an affordable price. This makes an ideal monthly box for the smaller family or couple as well as saving you money. 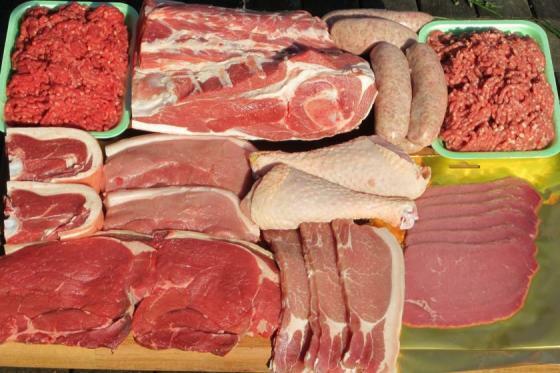 Our butcher has chosen an excellent variety of of our most popular cuts, something for every meal. There's a weekend joint, friday night steaks and plenty of midweek meals , as well as cold meat for sandwiches. Why not add a few extras to this selection by taking a look at our seasonal offers page? All the meat is freshly prepared in our Higher Hacknell Farm butchery and pack sizes and cuts may vary slightly. The total box weight is a minimum weight. In the event of a shortage of a particular cut we reserve the right to make a suitable substitution for another cut of the same or higher value. I was made aware of Higher Hacknell Farm from a Soil Association web site recommendation. They are an organic livestock farm that supply meat to households through farmers’ markets and a box scheme. They are agreeable to special requests and they clearly have the Environment in mind in terms of the love they have for their animals and land. I have been totally satisfied with the food I ordered from them and suggest that others try them out. Thank you.